Congrats, you have made it through the soul searching process of deciding to home school ! Now WHAT to teach? I took years off my life searching and fretting over curriculum. Overwhelmed by all the options, I was sure I would ruin my kids' education (and life) if I picked the wrong one. It came down to Sonlight and My Father's World. Well, that isn't true. I. Wanted. Sonlight. I had a friend who used it and I was convinced it was for me (notice I said me, not my kids). 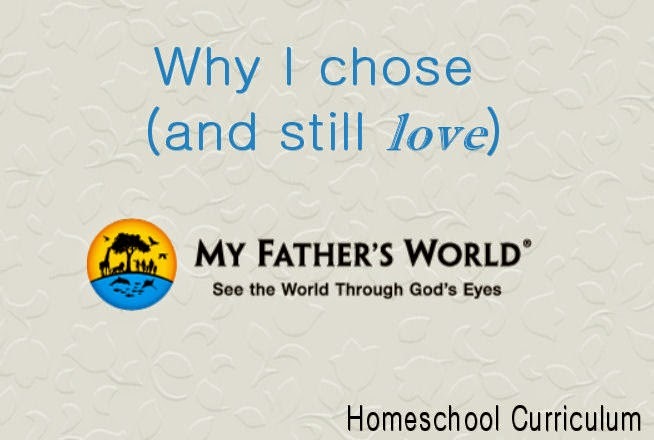 I have a another friend who had home-schooled her four kids for six years who led me towards My Father's World. I had seen My Father's World (MFW) online, but dismissed it thinking it was too traditional for me (again, note I said me, not my kids). Thankfully she was patient with my search for other curriculum, and kindly showed me the Kindergarten teacher's manual after I whined about how overwhelmed I was in my search. After looking at the Kindergarten Teacher's manual, I was HOOKED. We are now on our fourth year of using My Father's World, and I can't see ever switching. Here is why I love MFW, and why I chose it over Sonlight. You may also be interested in my post on how we survived (and thrived) our First Year of Homeschool. My Father's World has been perfect for us as it intertwines Unit Studies, Traditional, and Charlotte Mason approach throughout all the grades. I have felt the freedom to leave out or or emphasize the approach that works best for each child, or season in our life, without having to buy a separate curriculum. For Example, one of my children will zoom through his student sheet (more Traditional approach) in about 5 minutes, while the other spends 15 to 20 minutes painstakingly finishing his beloved sheets.We all enjoy cooking the foods from the country we are studying in Social Studies (Unit Studies). Both of my kids are bookworms, and will sit and read the book basket of living books for hours (Charlotte Mason), and they tend to read through our read-alouds before I get the chance to read to them! If your kids are not big readers, MFW differs from Ambleside Online/Pure Charlotte Mason because the book-basket is not an essential part of the day; see more details on "Pretty Pretty Books" below. For more on different Education Philosophies, see this post, Five Homeschooling Styles. As I said before, I originally wanted Sonlight. It is truly a great curriculum, I can not emphasize this enough. But the cost was prohibitive for us. In the beginning, when I was determined to use Sonlight, I tried to piece together their core program used, and even bought some Sonlight Language Arts materials on Ebay. Once I started adding up buying the books separately, even second hand, we were taking a larger chunk out of our budget than we could afford. I tried the library, but many books were not available and they did not give you alternatives in the curriculum. MFW packages include all the essential books you will need for the year, for a 1/3 of the price. 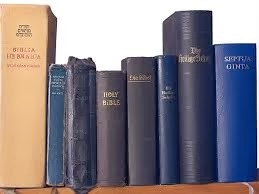 What we love is it gives you several book options for each subject in their "Book Basket" lists so there is not need to buy the books when I can borrow them for free, and you can read any or all that are available at your library. We use the Basic package. The deluxe is wonderful, but we found it VERY easy to fill our time with just the basic. My Father's World's utilizes a portion of their profits for translating the Bible into different languages. This was game changer in my process, and has kept me from wasting hours looking for used curriculum. I feel comfortable paying their extremely reasonable prices straight from their website because I know my money is being used in wonderful ways around the world. To see their work around the world go to MFW site-http://www.mfwbooks.com/setcnt/missions. If you have more than one child, this is a HUGE SELLER. Next to the cost, this is the main selling point to me. After 1st grade (or 2nd depending on ages of kids), you start a family cycle. We do Bible, History, Geography, and Science together as a family, then split for more individualized age-appropriate learning in Math and Language Arts. I honestly can not imagine having to teach 2 different history lessons to two different kids...let alone 3+ kids that many families have. Many grades are even set up for "tag-alongs", a.k.a toddler siblings who love to listen to all the great books. Your little one can listen to books about China, make paper lanterns, and eat fried rice with everyone; while your older child writes a country report during their nap time. Using one of the many Butterfly (Letter B) book suggestions to draw butterflies. Originally I was leaning towards Sonlight because of all the pretty books (children's books are my Achilles heel). Sonlight's main selling point is it's literature based and each package includes ALL the books your children will read need for the year. While this is awesome, it is very expensive, and doesn't give you flexibility in the books you read. With all My Father's World packages, all the essential books you need are included in your package, but MFW also gives you huge optional/ supplemental book list called your "Book Basket". Sometimes we reserve ALL the books in the Book Basket, sometimes none. It is a completely optional, but wonderful resource to have. I can pick and choose books from the long list of options in the "Book Basket", depending on what is available at my library or what I think will interest my kids. With the ability to reserve library books online and pick up at the branch closest to me, choosing MFW over Sonlight saved us hundreds of dollars. We all look forward to our bi-weekly Monday afternoon trip to the library, and the boys picked their own books as I pick up the books we will need for the next two weeks. The family cycle is full of living books as you study history of our nation and the world, which is the incorporation of my beloved Charlotte Mason philosophy. You learn about history and social studies, while getting filling your reading requirements for the day. Everything has meaning! No subject stands alone. My Father's World is closely related to Unit Studies because so many subjects relate back to one another, especially in kindergarten and family cycle. While studying "K" in kindergarten, we integrated science & art by making Kangaroo pouches, Bible with biblical truth that "God keeps us safe", and literature with story books in the book basket about Kangaroos. In second grade, we studied how yeast works in science as we studied Jesus was The Bread of Life in Bible. In third grade family cycle (Exploring Countries and Cultures), when you visit Mexico you can learn to make homemade tortillas in social studies, study desert animals in science, and read about Latin American missionaries in Bible. If you are a mom that needs structure, MFW is for you. If you are a mom that wants the ability to be flexible, MFW is for you. I have heard many moms say they started with an Open and Go curriclum like MFW, but as they grew more confident, they made up their own curriclum. While I have grown more confident, my basic personality as not changed. I am an ENFP homeschooling mom, which means I need structure or I get distracted very easily. It also means I do not like strict rules and inflexible structure, so I need freedom to be flexible. MFW does both for me. The teacher's manual is laid out in a teacher-friendly way, and all the subjects to compliment each other well and flow well for that day. For those of you who like to check off boxes, there are pretty little boxes for you to know you did all you need for that day! I stay on track by following the well thought out sequence, but I need to have flexibility to not do every little thing listed in my manual. I can add my own supplements for art and music easily, without losing a lot money or adding too much work to our day. I can skip Bible Memorization, because my kids are in AWANA. Math and Language Arts are NOT bundled in older grades. Like I said above in money, we buy the basic package. Their package structures gives me the freedom to find the right math for my kids' learning styles. MFW recommends Singapore math, but since it is not included in the basic or deluxe package,I can easily purchase another distributor without loosing money. We use Math-U-See because I prefer the Mastery Approach as opposed to the Spiral Approach in Singapore. The hands on learning and DVD of MUS are great for my visual and kinesthetic learners. No matter what curriculum you chose, remember your teacher's manual does not know you kids like you do! I must say that NO CURRICULUM IS PERFECT, including My Father's World. MFW is flexible because I can easily drop something from the manual, while still covering all learning bases for that day. 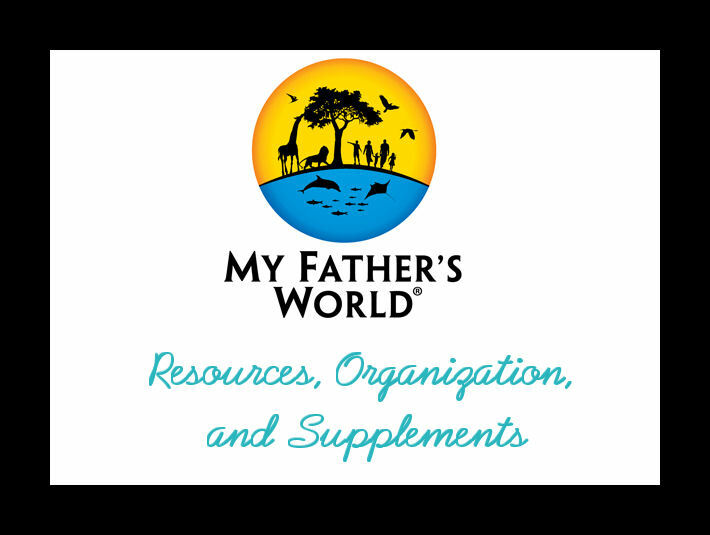 You can visit my My Father's World page to see all the ways we have adapted My Father's world to work for our family, including supplements and work-boxes. Some post contain affiliate links. Thank you for supporting my site at no extra cost to you. Thank you for this! I have a kindie and 2nd grader. We are using the 2nd grade Sonlight while hodgepoding the kindie curriculum, and I am considering purchasing something a little more structured for the kindie, but it's hard to fork down the money for Sonight for kindie. Maybe I'll give MFW a try for kindie and see how it goes! Interesting to read your comparison. Sonlight and MFW are the ones that first caught my eye when attending my first homeschool book fair when my oldest was 2. I really liked all the educational toys that MFW recommended for preschool, but it was to much "stuff" as we were getting ready to move overseas. I liked the idea of Sonlight, but thought it was to expensive. Then I watched 2 friends use Sonlight overseas, and appreciated that it was "everything included." I wonder how the cost compares when you don't have access to a library. We did not use MFW Preschool, we tend towards school of life and lots of books during those times. The cost for someone who does not have access to a library is a good point. . In My Father's World , everything IS INCLUDED, the book basket is supplemental . 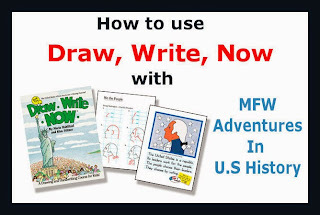 All essential books are included in your MFW package, and they are absolutely wonderful and can easily fill your day. We have had weeks where we picked up no books from Book Basket List, and some weeks we got them all. That said, the Book Basket adds a lot to the curriclum and is highly recommended. Great post!! Those are the reasons I have used it and loved it for 6 years now! I will say that we haven't ever gotten hooked on the book basket. I'm not sure if my kids aren't as curious as others (they *are* -- about what will flush down a toilet! ahem), or perhaps the books are more geared toward elementary students. I don't feel like we've missed a lot by not doing it, though the few weeks we tried *I* sure loved looking at the books! So point being: the book basket, like you said above, isn't essential, and *any* books on the week's topic from the library could be subbed for the MFW recommendations. Thanks for your insight, it is good to hear from someone who has done both! We have heard also that your library as a lot to do with how much you use the books basket. I think I use the book basket as a jumping off point for searching our well-stocked library. Our online library catalog will suggest books that are similar to one I looked up, so we reserve those too. I have to say that this year's book basket (Creation to The Greeks) has not been as exciting as in year's past. There has been multiple weeks (months) where I haven't gotten any books from the list. Last year's plethora of cultural and cook books from each country we studied (Exploring Countries and Cultures) spoiled us. Thank you soo much. We are going to do our first year of MFW this fall, starting with ECC. I was titter-tottering between MFW and another similar curriculum. My hubby likes that you get all the core books in the package. I am really looking forward to this coming school year and since we do year around, I am not sure of I can wait to start! Your post was very encouraging and reassuring!